Don't head to a restaurant to get tender and crispy curried shrimp. 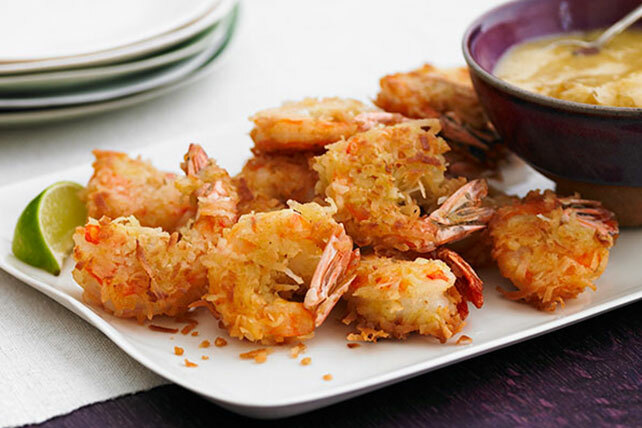 Make it at home with this Coconut-Curried Shrimp with Chutney Mayo recipe. Mix mayo, chutney, vanilla and 1/4 tsp. curry powder until blended. Mix coconut, flour and remaining curry powder in shallow pan. Whisk egg and water in medium bowl until blended. Dip shrimp, 1 at a time, into egg mixture; shake off excess. Coat with flour mixture. Heat oil in large saucepan on medium heat. Add shrimp, in batches; cook 2 min. or until golden brown. Remove from pan with slotted spoon; drain. Serve with chutney mayo. Prepare using butterflied shrimp. To butterfly the shrimp, place them on flat surface, then cut along back side of each shrimp to split open.